On 9 December 1948 the ‘Convention on the Prevention and Punishment of the Crime of Genocide’ was adopted by the General Assembly of the United Nations (UN). Getting the topic onto international agenda and the ratification of the document, however, were both difficult tasks. The Convention’s history goes back to a Polish-Jewish lawyer, Raphael Lemkin, who coined the term ‘genocide’. Lemkin wanted to make punishment and prevention of crimes by the state a crucial element of the international criminal law. This post presents a short history of this complex process. “The numerous instances of Genocide throughout the past and in recent times are a blot on civilization. They shock the conscience of mankind and have resulted in grave losses not only in human life but also in spiritual and material resources. They are a threat to world peace. Genocide can and must be opposed by international cooperation as the world organized itself against piracy and trade in women and children. The third UN General Assembly was to met in Paris in December 1948, and this petition made late that summer – a ‘solemn appeal’ similar in content and in structure to the convention – was made with the hope of influencing the proceedings. 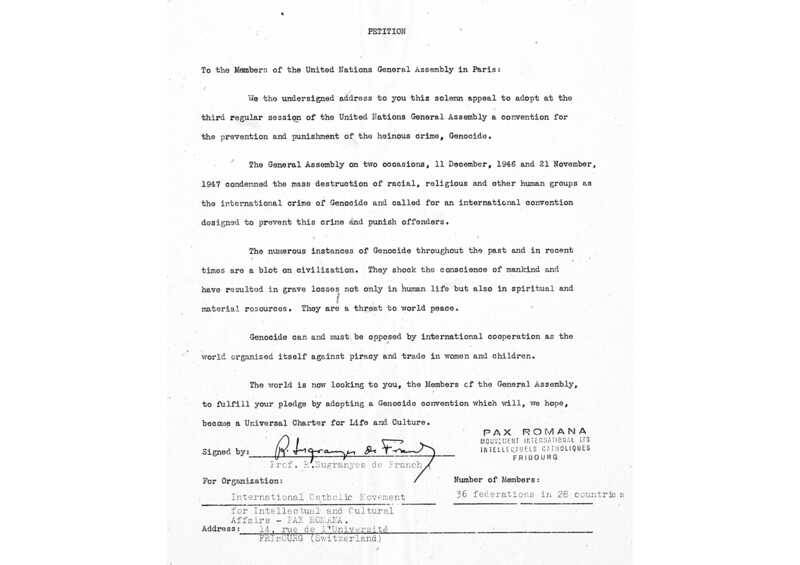 It was signed by a number of different religious, social or political organizations from all over the world, including, for example, the Federacion Peruada de Abogadas in Peru (25 Members), The Muslim Society in Great Britain (200 Members), The Salvation Army in Brazil (2250 Members) and the Pax Romana (see endnote 1) with 36 federations in 28 countries. These and many other groups were, in a sense, sending an SOS to the United Nations – an SOS that had never previously reached its intended aim. The person who initiated and prepared the appeal was Raphael Lemkin, a Polish-Jewish lawyer, who invested a tremendous amount of energy and time advocating the term ‘genocide’ as an integral element of the international criminal law. His idea to send petitions to the UN was not the only step he undertook to push the term ‘genocide’ on the world legal arena. He realized a broad lobbying campaign that included speaking, telephoning and writing articles on a global scale – the intensity of his work seems to be unimaginable for a one single man. Although the road wasn’t smooth, his efforts paid off. On 9 December 1948 (one day before the Universal Declaration of Human Rights was adopted), after an intensive politically-charged discussion, the General Assembly enacted the “Convention on the Prevention and Punishment of the Crime of Genocide”, based on a draft prepared by Raphael Lemkin. The convention described ‘genocide’ – whether committed in time of peace or in time of war as a crime under international law which has to be prevented or punished (Art. I) and defined as genocide “following acts committed with intent to destroy, in whole or in part, a national, ethnical, racial or religious groups as such: a) killing members of the groups, b) causing serious bodily or mental harms to the members of the group, c) deliberately inflicting on the group conditions of life calculated to bring about its physical destruction in whole or in part, d) imposing measures intended to prevent births within the group, f) forcibly transferring children of the group to another group.” (Art. II). The scale of responsibility was extensive under this convention. Punishable should be a) genocide and b) conspiracy to commit genocide, c) direct and public incitement to commit genocide, d) attempt to commit genocide and e) complicity in genocide. (Art. III). In this way, the word ‘genocide’ was used explicitly for the first time in international law, unlike in the case of Nuremberg Trials verdict, where the term ‘crimes against humanity’ was used. But what does ‘genocide’ actually mean and why was it so important for Raphael Lemkin? The word was formed by two components – the Greek word ‘genos’ (race, nation or tribe) and the Latin suffix ‘cide’ – from ‘caedere’, – to kill. He defined this word for the first time in his book “Axis Rule in Occupied Europe” (published 1944), within the next years explaining that this in various articles, lectures and interviews. Who was the man who sacrificed his entire professional career and private life for punishing and preventing genocide? Where did his interest for genocide come from? Raphael Lemkin was born 1900 in a Polish-Jewish farmer’s family, near to Wolkowysk (now: Belarus). He was home-schooled by his well-educated mother, Bella. Later he studied linguistics, philosophy and law in Lviv and Heidelberg. He was a linguistic genius – next to Polish, Yiddish and Hebrew, he spoke nine languages and was known to understand fourteen. The assumption that a Polish-Jewish lawyer began to question ‘genocide’ as a consequence of WWII is understandable, but not completely correct. In fact, he lost almost his all family in the Holocaust. He was forced to flee Poland (route: Lithuania, Sweden, Russia, Siberia, Japan, USA) and during his getaway he started to write a book that became the source of the genocide definition: “Axis Rule of Occupied Europe” (published 1944). But his interest in the question of massacres targeting minority groups started emerged in him much earlier. As a teenager he read the book “Quo Vadis” by Henryk Sienkiewicz, including the massacres of Christians initiated by Nero was an inspiration, effectively firing the starting gun for his future intellectual pursuits. Lemkin’s interest in dealing with massacres dated before WWII with the Armenian Genocide of 1915 and massacre of Assyrians in Iraq in 1933. He didn’t used the word ‘genocide’ at this time, but he tried to force the topic on the international law agenda without success. The Genocide Convention was ratified more the two years after adoption, on 12 January 1951. This was once again due to Lemkin, who was an active supporter of the ratification on a global scale. Even after having achieved his aim he didn’t stop working to popularize the term and raise awareness of the genocide question, investing even more of his time and money. He died of a heart attack at the age of 59. Despite being considered as a Nobel Prize candidate on several occasions, he fell into oblivion for many years. Today his impact on genocide studies is well-known and respected: the modern scholar can hardly imagine any book or article in genocide or Holocaust studies without references to Raphael Lemkin. His concept of genocide – broad chronologically and conceptually – is also present in the work of other current historians. Lemkin also inspired artists, like the Polish artist Jakub Jasiukiewicz, the author of the installation with the title “Lemkins Chamber” (2010). But even intensively speaking of Lemkin and underlying his role as the father of the Genocide Convention – we run the risk to simplify his work. To (try to) understand the complexity of the term, the political and social factors of bringing it onto the international agenda and at least to using (or avoiding) that in the present times – we have to risk a deeper look. Otherwise we lose the ability to learn and interpret a fascinating and complicated story. 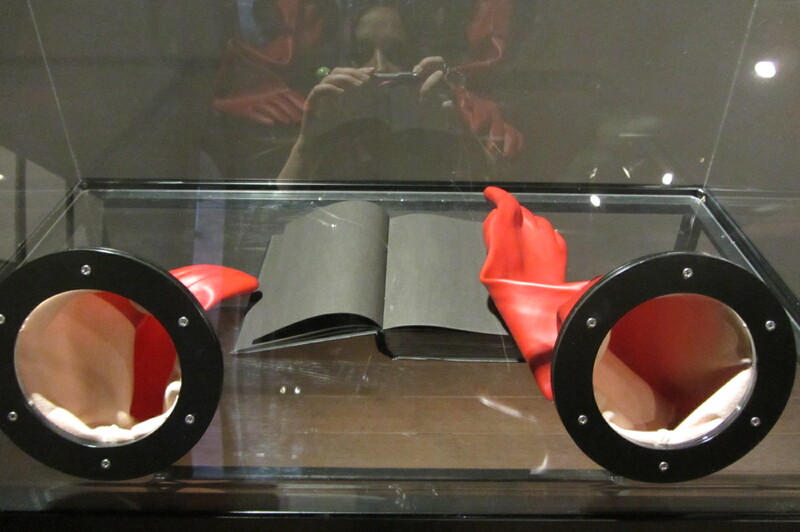 Only then can we see – as it is the case by Jakub Jasiukiewiczs “Lemkins Chamber” – a black book displayed in a glass showcase, touchable only through red rubber gloves that prevent contact with the powerful poison soaked in the pages. We see the book, but we don’t see any writing. Only the toxic black ink itself. We know that something very important and unspeakable happened, but we can’t read the details. In a similar way, we simplify the complexity of what really happened by discussing the term genocide alongside Lemkin’s name – merely naming Raphael Lemkin doesn’t mean that we understood his work, its intensity and sacrifice. We must strive to understand the nuances of history rather than falling into the trap of oversimplification and ease of understanding. In my research I concentrate on the judicial aspects of the punishment of war crimes committed during WWII in Poland. I am especially interested in the interpretation and communication on this matter between Poland and the Western European Countries and international instances after 1945. In order to contextualize my research in a broader chronological frame, I wanted to analyze the war and postwar debates about definitions of mass murder of WWII and attempts to prevent the crimes and punish the perpetrators with the help of an international criminal law context. During my fellowship at The Wiener Library, I benefited from the sources of United Nations War Crimes Commission (UNWCC, here i.e. Committee I: Facts and Evidences, Committee III: Legal Committee, Correspondence with National Office Poland, Polish Trial Reports) regarding Polish activities within the UNWCC. The second category of sources I could also work on was the impressive collection of Raphael Lemkin papers. While the originals are held at the New York Public Library, The Wiener Library holds a microfilm version of the collection, which largely document Lemkin’s intense interest in the subject of genocide. I was particularly interested in the correspondence with public officials, newspapers, academics, and religious groups that documented Lemkin’s struggle for support for the ratification of the genocide convention. The collection also contains drafts, notes, outlines, and summaries of his autobiography, Unofficial Man, as well as press releases and United Nations publications and reports. I am grateful for all the support given to me by The Wiener Library team, especially Verena Donig, Howard Falksohn and Kat Hübschmann, as well as John Cooper, the author of Raphael Lemkin’s biography. My thanks go also to Jessica Green for supporting me in preparing this EHRI Document Blog post. This article was made possible thanks to a Fellowship of the European Holocaust Research Infrastructure. Douglas Irvin-Erickson, Raphael Lemkin and the concept of genocide, Philadelphia 2017. John Cooper, Raphael Lemkin and the Struggle for Genocide Convention, New York 2008. Schabas, William, Genocide in International Law. The Crime of Crimes, Cambridge 2000. 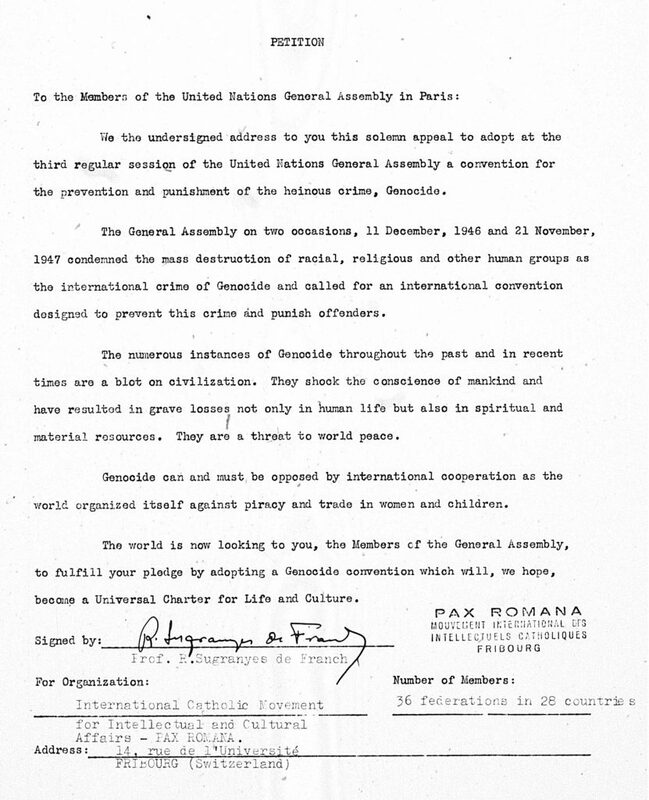 Raphael Lemkin Papers, Reel 1, Petition to the Members of the United Nations General Assembly in Paris, signed by Prof. R. Sugranyes de Franch, International Catholic Movement for Intellectual and Cultural Affairs – PAX ROMANA, without a date (probably August or September 1948), Wiener Library, London. For more look John Cooper, Raphael Lemkin and the Struggle for the Genocide Convention, Basingstoke 2008, Chapter 9: Paris, Preliminary Discussion of the Convention, pp. 143-150. Complete text under: http://www.un.org/en/ga/search/view_doc.asp?symbol=A/RES/260(III) (02.12.2017). The fact that the word ‘genocide’ was not mentioned in the Nuremberg Trial verdict was a big disappointment for Lemkin, who was also an advisor to Justice Robert H. Jackson. The crucial differences to the Nuremberg Trial verdict were i.e. referring genocide to the time of war and time of peace (Art. I), punishing of persons understood as constitutionally responsible rulers, public officials or private individuals (Art. IV) and establishing the International Court of Justice (art. IX). Martin Mennecke provides a short overview on the history of genocide within international law, from Lemkin, through the beginning of 2005 in ‘The Crime of Genocide and International Law,’ in: Barbara Boender, Wichert ten Have (eds. ), The Holocaust and other Genocides. An Introduction, Amsterdam 2012, pp. 145-162, online: https://www.niod.nl/sites/niod.nl/files/International%20Law.pdf (02.12.2017), for the term genocide look p. 145. Impressive evidences for this ‚almost monomaniacal haunting’ (S.L. Jacobs, p. IX) is provided in the collection of Raphael Lemkin papers at The Wiener Library. Lemkin also worked on two unpublished bigger publishing/book projects “Introduction to the study of genocide” and “History of Genocide” (going back in the concept and analyze of genocides to the antiquity and the middle ages and modern times) – both of them were not been published during his lifetime, but partly edited decades after his dead by Steven Leonard Jacobs under the Title “Lemkin on Genocide”, Plymouth 2012. A subjective perspective on Lemkins life in his autobiography: Totally unofficial: the autobiography of Raphael Lemkin, ed. By Donna-Lee Frieze, New Haven 2013. Like presenting his ideas on ‘barbarism’ and ‘vandalism’ to the League of Nations Conference in Madrid 1930, see Jacobs, p. IX. See Cooper, Chap. 12: „The International Campaign for Ratification of the Convention“, pp. 173-188. Nieczytelnośc. Palimpsesty /Illegibility. Palimpsests. Exhibition. Catalog, Wrocław 2016, p. 53. The exhibition had been presented from 17 December 2016 to 2 April 2017 at Muzeum Pana Tadeusza in Wrocław. The picture of “Lemkins Chamber” presented here with kindly permission by the artist. Photo by Marta Smolińska.